SS Multimill Sieves Manufacturer In India. We are the largest making “SS Multimill Sieves ” Manufacturers from India, The consistent efforts and precision of our dexterous team have enabled us in manufacturing and exporting SS Multimill Sieves . These SS Multimill Sieves are used for the purpose of separating solids from solids, liquids from solids as well as grading materials. Our offered SS Multimill Sieves are manufactured using premium grade raw materials that are procured from the authentic vendors of the market. These SS Multimill Sieves are provided to the customers in single, double and three models of deck. The clients can get these SS Multimill Sieves in bulk quantities from us at cost effective prices. Vibro Sifter Sieves Manufacturer In India. We are the largest making “Vibro Shifter Sieves” Manufacturers from India, The consistent efforts and precision of our dexterous team have enabled us in manufacturing and exporting Vibro Sifter Sieves. These Vibro Shifter Sieves are used for the purpose of separating solids from solids, liquids from solids as well as grading materials. Our offered Vibro Shifter Sieves are manufactured using premium grade raw materials that are procured from the authentic vendors of the market. These Vibro Shifter Sieves are provided to the customers in single, double and three models of deck. The clients can get these Vibro Sifter Sieves in bulk quantities from us at cost effective prices. 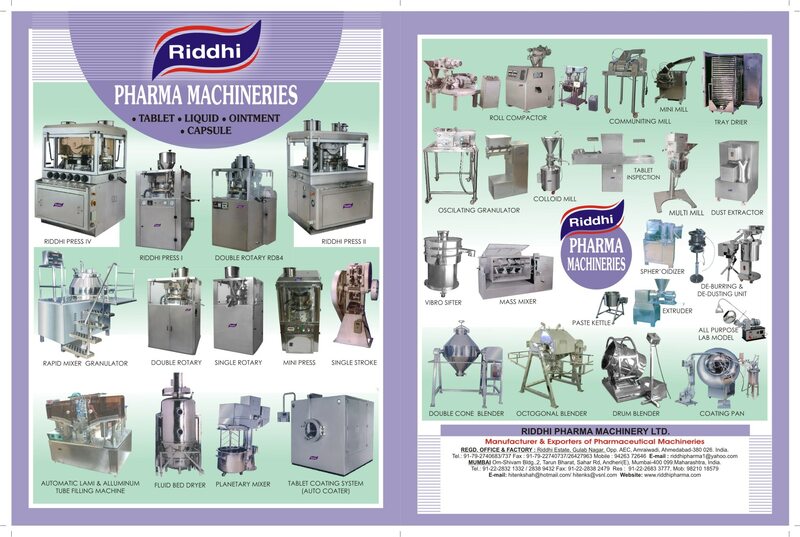 Manufacturer Of V - Blender In India. We are the largest making “V-Blender” Manufacturers from India.Owing to our wide expertise in this domain, we are regarded as the topmost manufacturer and exporter of V-Blender . These V-Blender are engineered using premium quality of stainless steel 316, which is procured from the authentic vendors of the market. Our offered V-Blender are available for the customers in different specifications, so as to fulfill their variegated requirements. These V-Blender are also provided in special customizations with electrical motor & panel. Our V-Blender is provided at the patrons' place within the stipulated time frame after strict quality tests. Coating Pan Manufacturer In India. We are the Prominet and largest making“Tablet Coating Pan” Manufacturers from India, Our range of tablet coating pans is extensively used for sugar and film coating of tablets, pallets and granules. The unit Of Tablet Coating Pan comprises of ellipsoidal shaped pan fabricated using stainless steel sheet and mounted on the gearbox shaft, which is driven by an electric motor. These t Tablet Coating Pan are available in standard and GMP model with SS 304 or 316 contact parts. High Capacity Ribbon Blenders Manufacturer In India, We are the largest making “High Capacity Ribbon Blender” Manufacturers from India.Ribbon Blenders a light duty blender mainly used for easy to mix powder components which are pre-processed like dried granules, pre-sieved powders etc. It is a low shear mixer and mostly used for solid/solid mixing. Solid / liquid mixing can also be achieved when high shearing force is not desired. It occupies less head room space for large volume mixing unlike Double Cone Blender , V Blenders etc. Salient Features Of Ribbon Blenders: Available in two shapes U-for Low to Medium Volume capacity(Singel shaft). W- for Large to Mega volume capacity (double shaft) Batch size based on 70% of Blender Volume Bearing mounted on lanterns out of Mixing zone to avoid contamination. Feeding through a charging port mounted on the top of the blender Reduced Material handling due to side discharge facility of processed materials. Preferred for lubrication of granules in large quantities. Dry Blending of capsule formulation. Mixing of Cosmetic powders. Capacity available 125 L to 5000 litres.... We are leading Manufacturer, Supplier & Exporters Spice Roasters. Spice Roaster is fabricated in U shaped sturdy body, having top cover centrally located and bottom discharge valve and with centrally mounted longitudinal shaft on which Spirals ribbons are mounted. Our specially designed spiral ribbons gives the best blending results due to three dimensional actions. Thus every particle comes equally in contact with the heating zone and being roasted equally. Spice Roasters are available with options as per customer requirements, having Full Stainless Steel, OR with contact parts in Stainless Steel and Non contact parts in Mild Steel with Enamel / Epoxy paint. In conventional Spice Roasters the heating is achieved through the Jacket filled with special purpose heating oil which is heated through Electrically operated oil immersed heaters. The heating temperature is controlled through digital temperature controller which can be achieved up to 250 Deg. C. The production with conventional electrically heated roaster has been affected due to recent power crises, the cost of the generator power with high electrical load is defiantly not affordable. Considering these problems we had recently developed the Roasters with LPG (Gas) heating arrangements. It has all that advantages which electrically operated roaster has such as Auto electronic operating, ignition, temperature controlling system etc. The heating temperature can be achieved easily in very short time up to 350 Deg. C., which is achieved with hot generated air circulated through specially designed heating jacket.